Summary: This story takes place in the near future when androids similar to humans, named Giftia, have begun to spread across the world. Giftia are a new type of android that possess human-like qualities, so much so that it can be difficult to tell Giftia and humans apart. However, due to difficulties in technology, the androids have a service life, and once they pass their expiration date, they lose memories and take a turn for the worse. Because of this, SA Corp. operates “Terminal Service” in order to retrieve Giftia that are coming up on the end of their service life. A new employee at the terminal service named Tsukasa Mizugaki starts her partnership with the Giftia Isla to retrieve the expiring androids. Plastic Memories uses the idea of Artificial Intelligence and takes it a step further. Generally we hear stories of A.I. on the verge of becoming human-like, but Plastic Memories fast-forwards to a time when the A.I. is already accepted by human kind and used in day-to-day life. The sadness enters with Terminal Service and how they must knock on the door of a family that owns an expiring Giftia and tell the family how they need to give up a member of their family. Talk about emotional! The series focuses on the Terminal Service, from their pickups of expiring A.I. to the day-to-day happenings in the office. I have mixed thoughts on the animation of the anime. I enjoyed the bright and vibrant characters, but the basic backgrounds were clearly lacking on quality. However, I’m not an animation snob, and I kind of thought the contrast between the simple backgrounds and the vibrant characters really made the characters stand out, so it is not too much of a negative for me. As for the characters, while some of the main characters were interesting and showed development, others were skimmed over and did not seem to serve much of a purpose. I enjoyed the pacing of the series, because it moved along without feeling rushed but also without feeling like nothing had happened for several episodes. Each episode served its purpose, meaning there were not filler episodes. The series ended in an appropriate way that wrapped up the story and did not leave the viewer with a massive cliffhanger, which I appreciate. The last thing I will say about Plastic Memories is that even though it is not a psychological anime, it leaves you thinking after the episodes are over. Giftia have a set lifespan, which made me wonder how I would live my life if I knew my “expiration date”. Also, how would I treat others if I knew their expiration? Would I be able to do the job of the Terminal Service? You might enjoy this if: You are ready to ride on a roller coaster of emotion. You might not like it if: You are searching for a light-hearted comedy. While there are some jokes peppered in, they are few and far between. 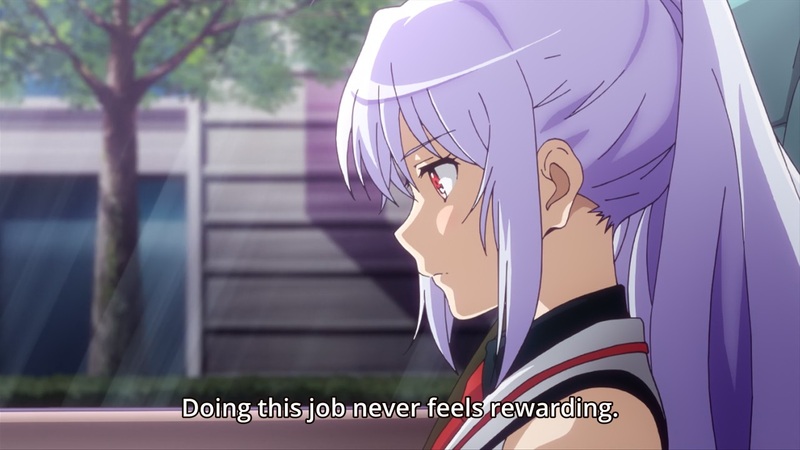 Note to the Viewer: Plastic Memories is a tear-jerker from episode one. You have been warned. This entry was posted in Anime and tagged anime, drama, fi, fragglepuss, grim, memories, plastic, reaper, review, robot, romance, sci, sci-fi, service, terminal. Bookmark the permalink.